This sabbatical is inspired by the period of Spanish history called La Convivencia (“The Co-existence”), in which the three Abrahamic faiths lived together in harmony for nearly 700 years. In this sabbatical we—pastor, family, and congregation—seek a deeper understanding of the co-existence between our religious identities, the demands of intergenerational ministry and family life, and the need for spiritual well-being and Sabbath time. This understanding will help me as a pastor, as a husband, and as father to balance the many demands of ministry and to share what I’ve learned with my congregation. This passage from Genesis 12 lies at the heart of our family life. My wife, Jenny, and I met when we were students at Harvard Divinity School. I was a Lutheran pursuing ordained ministry in the ELCA; she was a Jew studying Hebrew Bible. We fell in love but did not know how to reconcile our different faiths, especially around the prospect of raising a family. Our breakthrough happened when I preached a sermon about the call of Abram and Sarai from Genesis 12 for my field education church. In the course of reflecting on that text together, we found our way forward: we were both children of Abraham and Sarah; we were both people of faith. We could honor each another’s traditions while being deeply grounded in our own. Some twenty years later, we are married with four children: Ellie, Finn, and twin girls Dulcie and Tess. They are baptized and participate in the life and ministry of my church, while embracing in the observances of Jewish traditions, practices, and the story of Jenny’s family’s faith. A framed page from an old King James Bible with Genesis 12 hangs in our front hall, reminding us of our family’s beginnings, the values we hold, and the traditions we honor. Even though studies show that interfaith families, nuclear and extended, are on the rise—and my congregation is filled with families of mixed religious identities—in our experience when it comes to clergy couples and families Jenny and I are still a rarity. While we value our family’s various religious traditions, we also recognize the historic tensions between Christians and Jews and the harm that has befallen Jews as a result. Throughout history Christian theology has been twisted to justify the persecution of Jews and other religions. Jenny’s family, Jews from Poland, were among those who suffered under that type of perversion of the Gospel; some were displaced and some perished at Auschwitz. When our children were younger they would ask us, “Who in our family is Lutheran and who is Jewish?” As our children have gotten older, these questions around identity, community, and belonging have become more complex and harder to address. The need to explore these issues around co-existence has become even more urgent as we have seen a spike in anti-Semitism and a deep-rooted fear of the other: how do we lift up our kids’ Jewish identity while they are living a Christian life? How do they hold these two identities together? Do they have to choose? In the Middle Ages, Andalusia, Spain and southern Portugal were the heart of “La Convivencia”—when the three Abrahamic faiths, Christianity, Judaism, and Islam—lived and worshipped together in harmony. The practices, architecture, and charisms of these different religions enriched and informed one another. Centuries later, the evidence of that cooperation remains. In the late 15th century, Andalusia suffered under the Spanish Inquisition, one of the worst moments of Christian hegemony, bringing to a close that chapter of cooperation. We hope to explore our questions of interfaith identity in the context of this medieval history. Traveling in Portugal and Andalusia will allow us to investigate our interfaith identity against the backdrop of Portuguese and Spanish culture. We propose an itinerary that will take us from Lisbon to the heart of Andalusia—Seville, Cordoba, Grenada—and then north to Toledo and Madrid. All of these locations offer a rich, living history of interfaith influence and identity. For example, within the barrio of Santa Cruz, the old Jewish quarter in Seville, lies the Seville Cathedral: a huge gothic cathedral and La Giralda its Moorish bell tower—which was once a minaret. Within the “Juderia,” the old Jewish quarter, in Cordoba is the Mezquita—a mosque dating back to the 8th century, within which a cathedral was built in the 16th century. It is home to one of only three medieval synagogues remaining in Spain. Toledo is home to the Sinagoga del Transito (Museo Sefardi)—a 17th century synagogue and Spain’s national Jewish museum, as well as the Sinagoga de Santa Maria la Blanca—a synagogue built by Muslim workers around 1200, and later became a church in 1492 after the expulsion of Jews from Spain. We also plan to take the time and soak up the music, culture, geography, and food of the region, all of which reflect this rich and diverse history. To help further enhance these experiences we plan to invite Jenny’s parents to join us for this leg of the sabbatical. Her father is Jewish, and her mother is an agnostic, descended from a long line of Methodist ministers. Their interfaith marriage has provided a model for our own family’s embrace of multiple religions and cultures. We will have three generations to help us reflect on these faith stories, connecting us to our past while laying the foundations for our future. By exploring more deeply our family’s interfaith identity I will be better able to assist my congregation, our friends and family, local faith communities, and neighbors in interfaith relationships and collaboration. Our congregation and our home are located in Upper Dublin Township, a community that is 40% Jewish. Our congregation has a history of episodic collaboration with Congregation Beth Or, a local Reform synagogue, and two different mosques in Philadelphia. However, much work remains to be done to bring us to a true understanding of our neighbors’ faiths and how those faiths co-exist in our broader communities. These challenges are not unique to Upper Dublin Township or Philadelphia. Furthermore, we live in a time when fewer people identify with any religious tradition at all—or identify in non-traditional ways. The number of religiously unaffiliated or “Nones” continues to rise. Religious identity has long been treated as something that is fixed, but I believe we are being called to imagine ways in which religious identity can be more fluid and yet still faithful. As we know well, in our family it is not just about how you identify (Jewish or Christian) but how tightly or loosely one holds one’s beliefs—and how those are practiced and expressed. It has long been one of my dreams to walk the Camino de Santiago de Compostela, the ancient pilgrimage route that leads to the cathedral that is said to be the resting place of the remains of St. James. I studied medieval church history in Divinity School and have long been fascinated with pilgrimage and other spiritual practices and piety of that time. Books like Paul Cohello’s The Pilgrimage and Joyce Rupp’s Walk in a Relaxed Manner have only increased my interest and desire to walk the Camino. 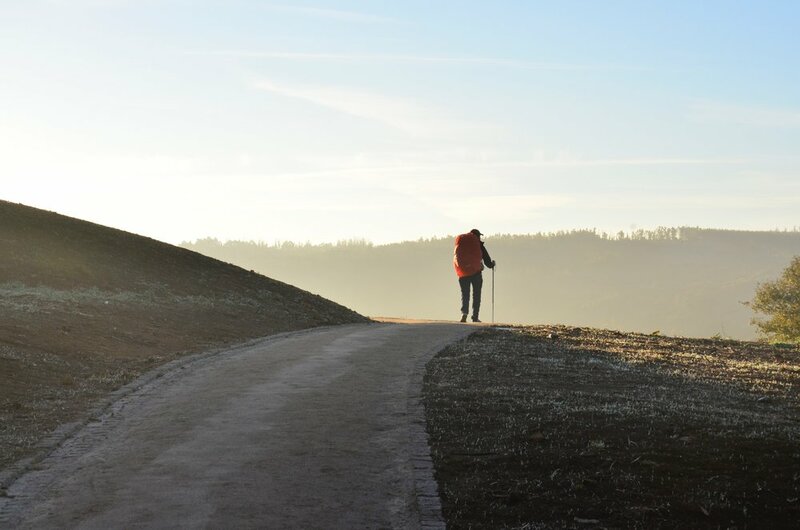 I am doing an eleven-day solo walk on the Camino using the “Camino Portugues,” the pilgrimage route that runs from Lisbon to Santiago de Compostela, which approximately 19% of pilgrims take to Santiago. I will begin my route in Porto, Portugal making the trek to Santiago, traveling approximately 16 miles a day. Placed at the beginning of the sabbatical, this pilgrimage will allow me to decompress, shift gears, and set the tone for the rest of the sabbatical with a time of spiritual seeking and renewal. Walking the Camino not only connects with a life-long fascination with pilgrimage, but also relates to a more recent development in my life: an effort to cultivate greater health and well-being to sustain me spiritually, physically, emotionally, and mentally over the long run. I call this my “more maintenance” campaign, as in, “I just require more maintenance than I used to.” Part of this campaign has included a newfound passion for hiking. I find the outdoors deeply restorative, providing an “analog” spiritual practice in the midst of a digitally-infused life and ministry. Digital technology plays a big role in my parish ministry and has for a decade. I use blogs, podcasts, several different social media, and our church website to form faith, build community, and evangelize. I have also written extensively about the practice of digital ministry. This has contributed to a feeling of digital fatigue and I welcome the opportunity on this sabbatical to unplug from the demands of life online and practice “digital Sabbath.” I want to practice being fully present during this incarnational time on the Camino by myself and throughout the sabbatical with my family. As with any pilgrimage, it is impossible to predict what the personal spiritual outcomes will be. I will embark on the Camino with a willing and open heart, seeking to deepen my relationship with God. There are a number of ways I can share this experience with my congregation beside just a personal travelogue. We may engage in labyrinth walks, restorative worship experiences, or perhaps a local suburban pilgrimage. Our four children are the center of our lives; we want this sabbatical to be meaningful for them. This sabbatical falls at the perfect time, as our kids are at ideal ages for this experience: the young ones are old enough to travel well, and our older ones have not yet left home for college. In discussing the sabbatical and additional travel beyond Portugal and Spain, we looked for sites that would help us spend time together as a family while experiencing the history, culture, and wonder of Europe. Our kids expressed a desire to visit Rome, Venice, and Paris. We plan to visit these cities, along with Cinque Terra (in Italy) and Provence (in France) over the course of three weeks. As a spiritual “stretch goal”, we will work against our tendency to over-plan and over-program ourselves and spend enough time in each location so that we don’t have to rush. We want to experience the slower and more humane rhythms of life in Europe which contrast so markedly with the typical pace of life in the United States. We think activities like art classes in Provence, cooking classes in Rome, or glass blowing classes in Venice would be a great way for our kids to experience these beautiful cultures. Our stops in Cinque Terra and Provence will provide respites between our visits to the major cities. We also see this portion of the sabbatical as a time to continue a tradition of exploring Europe as a family. Jenny’s mother will remain with us the first week of this leg of the sabbatical to give us an extra adult to help organize the kids and provide Jenny and me time to explore. We also look forward to hearing stories from her mother about her own travels in Europe. Jenny’s parents honeymooned in Europe for a year in 1971-1972, traveling all over the continent in a VW camper bus. They then took their three children to Italy and France in the summer of 1988 revisiting many of their favorite spots. Jenny and I backpacked in Europe for six weeks during our honeymoon in 2000. In an effort to continue this family tradition we’d like to revisit some of these common places and experiences, passing these stories down to the kids, so they can make their own memories. Documentation will be an important part of this experience for all of us. Being digital natives, our kids are naturally inclined to document their experiences as they live them. We want to facilitate this, not only to give them a way to relive the trip in the future, but to help them reflect on what they see and do, and to give structure on what will be a full trip. Our oldest takes a photography class at the high school, our middle son likes editing video, and our youngest enjoy artwork and writing. We hope they will capture their experiences in ways that are meaningful to them. When we return to church and present about our experience, we’d like the kids to each take a part in telling the story of our sabbatical. We will also share some of our materials on the church website and other appropriate digital platforms. Following these travels across Portugal, Spain, Italy, and France, we will head to Jenny’s family’s cottage in Quebec, Canada. The cottage is our favorite place on the planet. It is a place where we can just let the world go. Jenny and our kids spend every summer at the cottage and I typically spend the last few weeks of the summer there with them. There we are surrounded by the beautiful quietude of nature, and enjoy swimming, canoeing, and campfires. At the cottage we spend time with family and friends, whom we rarely have the chance to see throughout the year. This will be pure Sabbath time for us to recuperate and reflect on our travels, and sort through our videos, pictures, artwork, and journal entries. I plan to do some writing and reading about the experience of keeping Sabbath time. There is also an opportunity to do some more hiking in the beautiful Gatineau Park located nearby. This sabbatical from the daily work of ministry will be incredibly renewing for me both personally and professionally. The pilgrimage on the Camino will help me deepen my spiritual life. The time and experiences with my wife, children, and extended family will bring us closer as a family and make memories that will last the rest of our lives. For our congregation, the sabbatical will generate excitement, provide educational opportunities to learn about church history and culture beyond Lutheranism, and help deepen our interfaith partnerships, and navigate a world in which religious identity and affiliation is changing. Our church is full of high achievers who find it hard to take Sabbath time. This time apart will model, offer practical strategies for rest, renewal, and tending the soul. It will help us to deepen our connections within our families, to our neighbors, and with local houses of faith. It will also help us navigate a world in which religious identity is changing—in which religious identity can be both fluid and faithful.